Hello and welcome to exampundit. 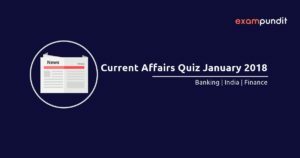 Here is the first set of Current Affairs Quiz – January 2018. The following questions are based on the Banking, Financial, Appointments, Indian and World related news. How much amount did Maharashtra government allocate for the farm loan waiver scheme and for repayment to farmers whose produce was purchased by the State? Who among the following was appointed Foreign Secretary of India? Shahzar Rizvi is associated with which sports? Who won the 2017-18 Ranji Trophy? Which of the following company recently human-like text-to-speech Artificial Intelligence, Tacotron 2? How much amount did government approve for Jal Vikas Marg Project (JVMP) for enhanced navigation on the Haldia-Varanasi stretch of National Waterway-1 (NW-1)? Which of the following rural bank did recently operationalize its first desktop ATM? How much amount of loan assistance under the Rural Infrastructure Development Fund (RIDF) did NABARD sanction to Odisha? With which of the following bank did PHD Chamber of Commerce and Industry (PHD-CCI) recently sign a MoU for credit facilitation for MSMEs on chart? Which of the following company did recently adopt 2018 as the ‘Year of Trust’? Which of the following state did recently announce to implement the integrated solar based micro irrigation scheme (ISBMI) in all districts of the State? Gas India Limited recently commissioned India’s second largest roof top solar PV power plant in ___________. Reliance Industries Limited (RIL) has commissioned the world’s largest refinery off-gas cracker (ROGC) complex in _____________. India International Coffee Festival will be held in _________________. The famous Dhanu Jatra festival believed to be the largest open air theatre in the world, is held every year in _________. Which of the following is the theme state of Surajkund crafts fair 2018? Kookhyun Shim was appointed the Managing Director & Chief Executive Officer of _________. Chess grandmaster Viswanathan Anand bagged a bronze in the World Blitz Chess Championship. The World Blitz Chess championship 2017 was held in ___________. Government of India announced the details of electoral bonds for political funding. What is the maximum amount of electoral bonds? The newly announced electoral bonds for political funding will be available at the specified branches of which bank? Indian Railway Catering and Tourism Corporation (IRCTC) will be launching a co-branded debit card with ___________. State Bank of India has joined hands with National Bank for Agriculture & Rural Development (NABARD) to promote joint liability groups method of lending in which state? Union Minister of Women & Child Development Maneka Sanjay Gandhi on 2 January 2018 inaugurated the online portal ‘NARI’ for women empowerment. What does R stands for in NARI? Name the first Gulf nation(s) to introduce Value Added Tax. India and Pakistan on 1 January 2018 exchanged the lists of their nuclear installations under an agreement that aims to prevent both sides from attacking such facilities. Consecutively, this is the _____ exchange between the two countries. Current Affairs Quiz – January 2018 Set 1 is IMPORTANT for IBPS CLERK MAINS!